9.00 a.m. - 5.00 p.m., lunchtime break 12.00 p.m. - 1.00 p.m.
Guide texts in English, French, German, Italian, Spanish, Polish, Japanese, Russian, etc., can be borrowed by visitors from the library custodians. 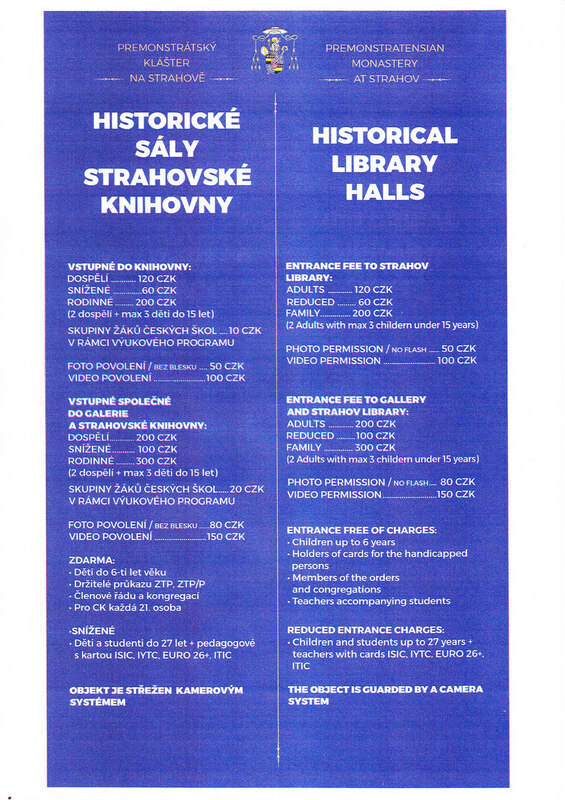 For information about the special tour through the interior of the Strahov Library, please e-mail erika@strahovskyklaster.cz. The number of visitors is limited. We are sorry that we cannot satisfy all of those who are interested. Thank you for your understanding. It is not necessary to order the non-special tour through the exposition. Bookshop: 1st floor, in the first room of the exhibition. Contact +420 233107715.